There are 11 guest villas to choose from on North Island. 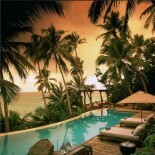 Villas 1 to 10 are placed discreetly in the tree-line, facing onto Anse d'est beach. Villa 11 is completely unique in it's siting. It's layout has been designed to accommodate the incline along the extreme northern side of the Anse d'est beach, and is secretly tucked away in the Takamaka forest. The beach views from this villa ia truly spectacular from every angle, together with the unique manipulation of the design, this separates this remarkable villas from the rest. North Island is located in the Seychelles, in the Indian Ocean. Many airlines fly into the international airport Mahe (capital of the Seychelles). From Mahe, we can arrange a helicopter transfer for you (price on application). 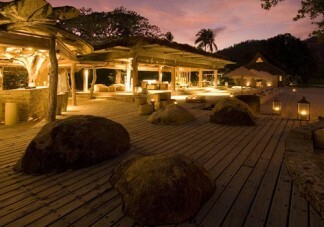 North Island is located in the Seychelles, and has 11 luxury lodges for you to choose from for your stay. It is a conservation project and the lodges have been built trying to capture a rare experience in harmony with the environment. Materials have been utilized wherever possible that were reaped from the rehabilitation process. North Island is an example of a sustainable ecological utilization of a precious natural treasure. There are 11 guest villas on North Island. Each villa is 450 square metres which is extremely spacious and allows guests the privacy and exclusivity that they are after. Each villa has a master bedroom, a lounge, living area and sala deck. The lounge is sometimes used for a third person (child) to be accommodated, or it can also be turned into a study. Each villa has been handcrafted by local people using local materials such as wood, local stone, glass and thatched roofs. A luxuriously proportioned master bedroom with change-room and writing area leads onto a large en-suite bathroom with marble bath and two showers, one indoor and one outdoor. The bedrooms are air-conditioned, and all rooms have overhead “punkah punkah” fans. The fully retracting sliding doors allow for uninterrupted views onto the lawns and the turquioise seas in front of each villa. There is satellite television, a DVD/CD system and Internet access. The kitchen leads off the lounge/dining area. A private plunge pool and sala are the finishing touches in this private sanctuary. The personal service offered on North Island is second to none, and can be tailored to meet your needs and preferred lifestyle. The staff tend to the vegetable and herb gardens on the island and only the freshest of foods will be offered for your dining needs – whether you dine on the beach, in your villa or in the restaurant. 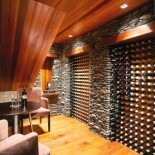 There is also an extensive wine cellar where you can pick a vintage to suit your pallet, with the help of experts if required. There is a “no menu” concept on North Island, and the chef will speak to each guest individually to explain the concept and to discover personal food preferences, and will design the day’s menu around this. The rate for North Island is all inclusive - including Local Government tax of 7%, breakfasts, lunches, dinners and all alcoholic and non-alcoholic drinks and cocktails except premier drinks on the reserve list, all Scuba Diving courses, Scuba Diving activities and snorkeling in and around the North Island & Silhouette dive sites, sea kayaking around North Island, shore based fishing on North Island and half day fishing charters, the use of one “North Island Buggy” per villa for the duration of your stay, the use of mountain bicycles. The rate DOES NOT include any spa treatments including In-Villa massage and health therapy treatments, full day Deep sea fishing charters, telephone calls and internet connection. There are a variety of activities on offer to North Island guests to help them enjoy the environment and magic of the island. Scuba diving is very popular with the Seychelles forming one of the longest coral reef systems in the world. A guided scuba experience is offered, and Open Water Dive certification can also be gained on North Island with qualified PADI instructors. Similarly, snorkelling is also a popular activity, and depending on your ability, there are also guides available who are underwater experts! Sea kayaks are also available with all necessary guidance and tuition on offer. A fully equipped air conditioned gym is also available for guests use next to the main swimming pool.